Today’s recipe is sponsored by Finlandia™ . All opinions shared are my own. 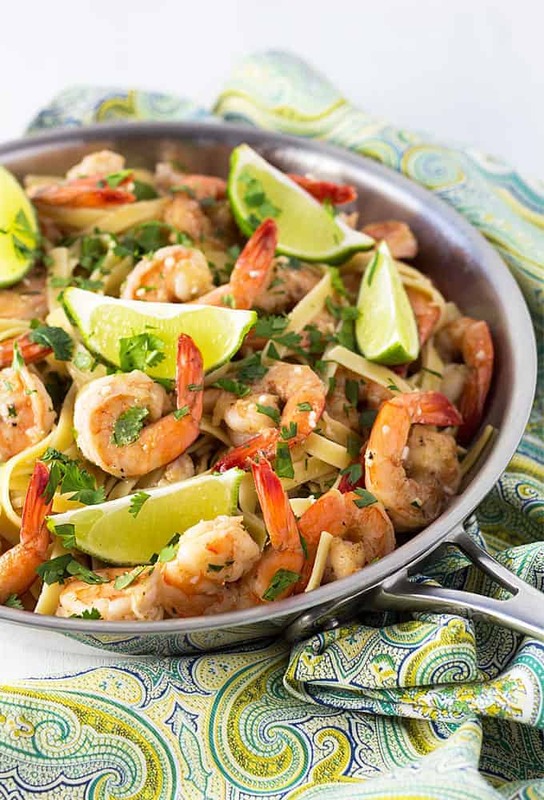 Packed full of flavor, this Buttery Cilantro Lime Shrimp Pasta is your new go-to recipe for seafood night! I am so fortunate to have access to fresh, local shrimp. 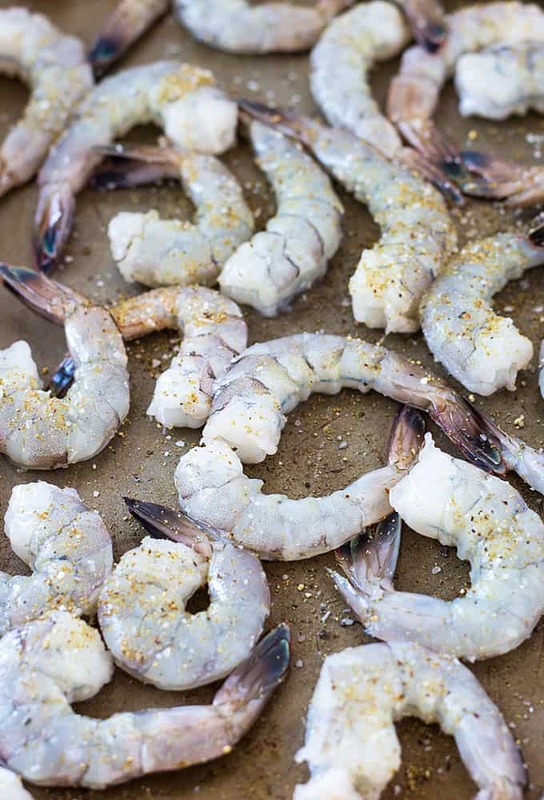 The shrimp in this recipe are seasoned with a simple mixture of ground cumin, salt and pepper. 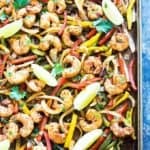 What’s even better is that if your shrimp are already peeled, this recipe comes together in under 30 minutes for an easy and delicious weeknight meal — BONUS! 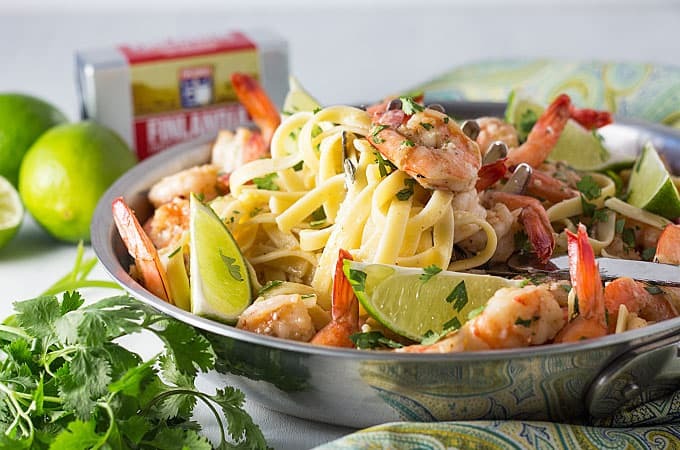 Finlandia butter is made from the purest milk from Finnish family-owned farms with ZERO artificial ingredients or added hormones. Finlandia is owned by farmers who treat their cows like family, which is important to me… I’m definitely an animal lover! 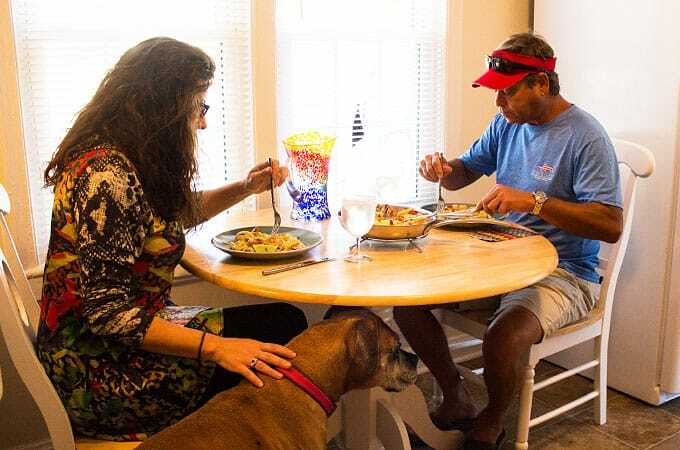 My friends Christy and Rick eat with me sometimes during the week (they know how much I love cooking!). My rescue dog Baby is like family, as you can tell. 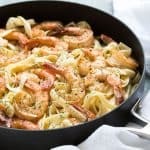 There is definitely a difference when it comes to the flavor of butter, and when it comes to cooking shrimp I don’t skimp. 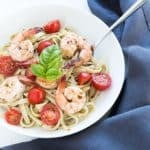 The simple Finlandia butter sauce in this pasta is off-the-chart amazing! 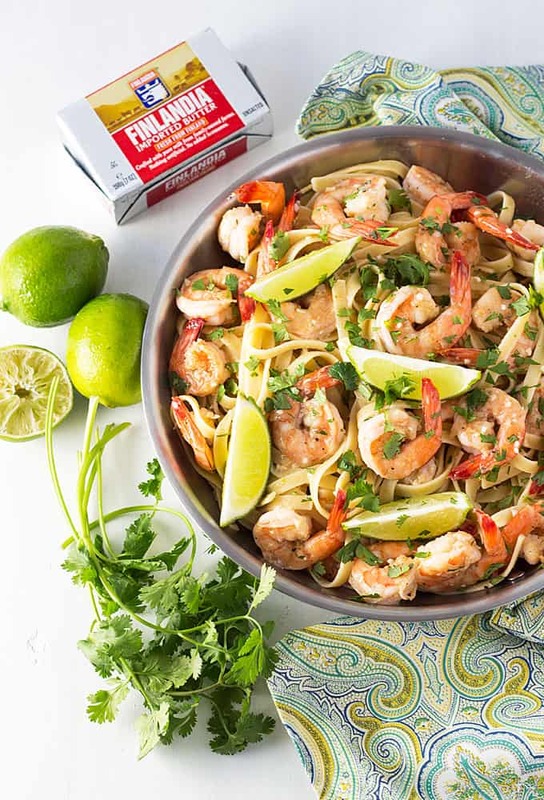 Be sure to vote for your favorite recipe here for a chance to win $1000! (Contest sponsored by Finlandia) The contest is now closed… thank you for your votes! 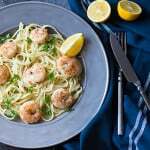 Perfectly seasoned shrimp in a velvety butter sauce with pasta in less than 30 minutes! Cook pasta according to package directions and drain in a colander. While pasta is cooking, stir together cumin, salt and pepper in a small bowl. Season shrimp with the mixture. In a large skillet over medium heat, melt 3 tablespoons of the butter. 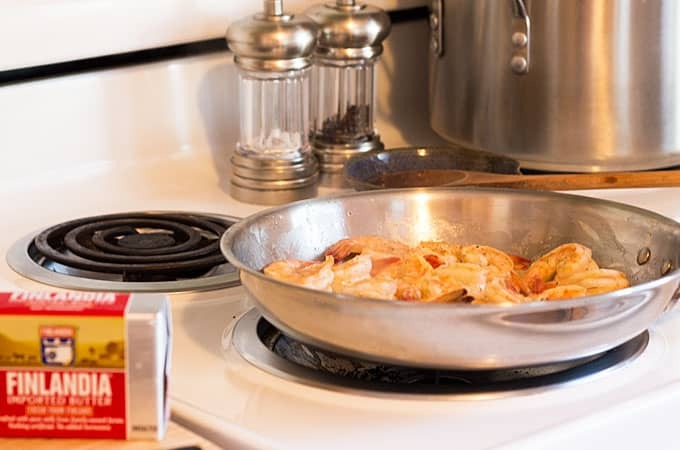 Add shrimp to the skillet and saute for 3-4 minutes (stirring frequently), or until shrimp have just turned pink on both sides. 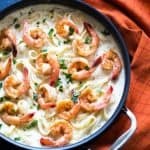 Transfer shrimp to a plate and set aside. Using the same skillet, add minced garlic and cook until fragrant, stirring constantly for about 30 seconds. Add wine and lime juice, while continuing to stir. Add remaining butter in small cubes. Stir constantly until sauce is slightly thickened, about 2 minutes. Remove skillet from heat and pour sauce over drained pasta, tossing to coat well. 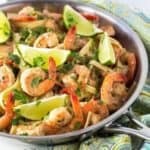 Top with the shrimp and sprinkle with cilantro. This looks incredible! 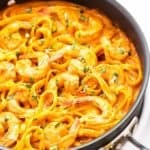 You certainly have a way with shrimp and that buttery, delicious sauce – WOW!